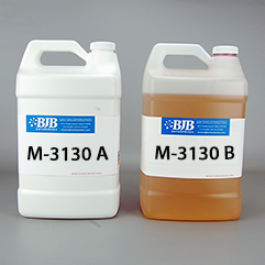 BJB’s “M Series” with work times between 10 and 20 minutes is perfect for a variety of part and mold applications. Theseflexible systems exhibit exceptional physical properties. M-3130 is ideal for processing by hand or cartridge-dispensing with ourCPE handheld dispense equipment. For faster work time see our F-1 Series and for longer work times see the L Series of urethaneelastomers.